Generally speaking, the European settlers in North America coined the phrase 'Indian' or 'Red Indian' to describe the North American tribes they found while they were settling what is now the USA. To the north of this vast collection of varying regions and climates were the native settlements of what is now Canada, while to the south were the various peoples of modern Mexico, most especially the Aztecs. 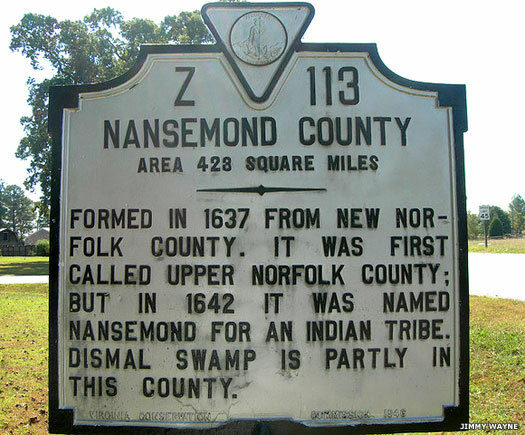 The Nansemond were located on the eastern seaboard in what is now the states of Delaware and Maryland (eastern section), as one of the most southerly of the Powhatan confederacy's tribes. With part of the Atlantic coast to themselves, they were neighboured by the Warraskoyack to the north, the Chesapeake to the south, beyond which were further Eastern Algonquian tribes, and the large Iroquoian-speaking Nottoway tribe to the west. Weyhohomo is weroance of the Nansemond, one of the largest sub-tribes of the Powhatan confederacy. Exhibiting traits which could be equated with paranoia, Weyhohomo has collected a huge cache of weapons, food, clothing, and other necessities which are stored in his main village, just in case his tribe is attacked. His concerns proved to be entirely justified. Initially the Nansemond are very wary of the British Colonists when they begin to settle around the area which will become Jamestown. They have every reason to be cautious as, in 1608, one of the Nansemond towns is raided and houses and canoes are destroyed in order to force the Indians to give the settlers corn. Captain John Smith and his men demand four hundred bushels of corn or the village will be demolished. 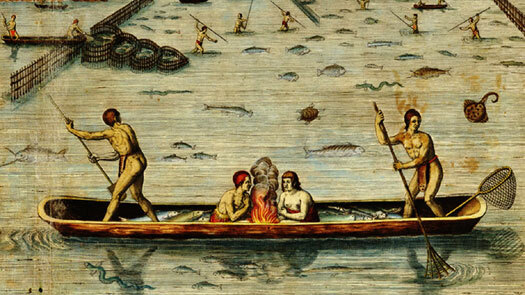 The Indians agree and the English leave with most of the tribe's corn supply. Relations with the English deteriorate even further when the settlers try to gain control of Dumpling Island, traditional home of the weroance (located at Wilroy Swamp, upstream from the mouth of the Nansemond River). This is also where the tribe's sacred items are kept and their temples are located. The English destroy the burial sites of the Nansemond tribal leaders and desecrate those temples. They ransack houses and the tribal religious sites for valuables, such as copper ornaments and pearls. These items are torn from the dead bodies of buried leaders as their graves are defiled. In 1610 the Susquehannock attack the Patawomeck villages in northern Virginia despite additional protection provided by the settlements of the British Colonies. Skirmishes between the English and natives for food also occur during an exceptionally dry spell of weather that lasts for seven years (according to dendrochronological samples taken for the region). This forms part of the First Anglo-Powhatan War (1609-1614). The English begin to move into Nansemond lands. Affected by these continued incursions in the seventeenth century, the tribe splits apart. Those who convert to Christianity and adopt more English customs remain along the Nansemond River and become farmers. Those who go to war against the settlers in 1644 have a different fate. The Second Battle of Virginia - sometimes referred to as the start of a Third Anglo-Powhatan War - takes place in 1644, with the native Powhatan confederacy still under Opechancanough. This bookends the Second Anglo-Powhatan War (1622-1644). The result is that the English completely crush the Powhatan and take control of eastern Virginia. The Powhatan survivors leave Virginia, with those of the Nansemond who had fought fleeing towards the south-west and the Nottoway River. Here they are assigned a reservation by the Virginia Colony. Being distracted by this war the colonists have little time to concern themselves with the Susquehannock. Unchallenged, the Susquehannock extend their dominion south from the Susquehanna River to the Potomac River where they claim the area between these two points as hunting territory. They do not ask permission of those tribes that live in this area. The signatory tribes are: the Appamatuck, Nansemond, Nantaughtacunds, Pamunkey, Portabaccoes (one of the late-appearing tribes in the confederacy which may be a new formation or the amalgamation of previous units), and Weanoc of the former Powhatan confederacy, plus the Meherrin, Monacan, Nottoway, and Saponi. This treaty marks the end of the Indian period. The Indians along the coast lose their remaining land and are confined to small reservations because certain chiefs (Asconnowett, Osattaka, and the late Totopotomoi) regard[ed] themselves as 'tributaries to His Sacred Majestye and ye soveraignitye of the land where they live and doth belong to His Majesty'. Confirmed as native subject leaders are the 'Queen of Pamunkey', the 'Queen of Waonoke' (the Weanoc), 'King Serraohque of the Nottoways', and the 'King of Nansemond', amongst others. Many former member tribes of the Powhatan confederacy are extinct by 1722, having drifted away or merged with other remnant groups. The Rappahannock had already lost their reservation shortly after 1700, while the Chickahominy had lost theirs in 1718. These groups and the Nansemond fade from public view. Only the Pamunkey, Mattaponi, and an Eastern Shore group keep reservations, although their land constantly shrinks in size. By 1744, the Nansemond cease living on their reservation and migrate to live with the Iroquoian-speaking Nottoway tribe on another reservation nearby. The Nansemond sell the last of their reservation lands, three hundred acres of the Nottoway River in Southampton County. They are subsequently known as 'citizen' Indians. They have to wait another one hundred and ninety-two years before they receive official state recognition in the USA, and the Pamunkey have to wait until 2015 for theirs.